I awake to the gentle sound of the sea and as I rise from my slumber, I look out my window and smile. Not too far away, 3ft waves roll toward the beach, beckoning me to go play. The sun is out, the sky is blue and it’s time to go surf. I arrive at ‘Surfers Corner’ in Muizenberg and find myself in chaos as throngs of people bustle on the beach and in the sea, soaking up this beautiful day like seals in the sun. I suit up and make my way to the waters edge. Everywhere I look I see people, most with some sort of surf craft at hand. Muizenberg is one of many crowded surf spots in Cape Town and I would even go so far as to say that it’s quite possibly the most crowded surf spot in South Africa. 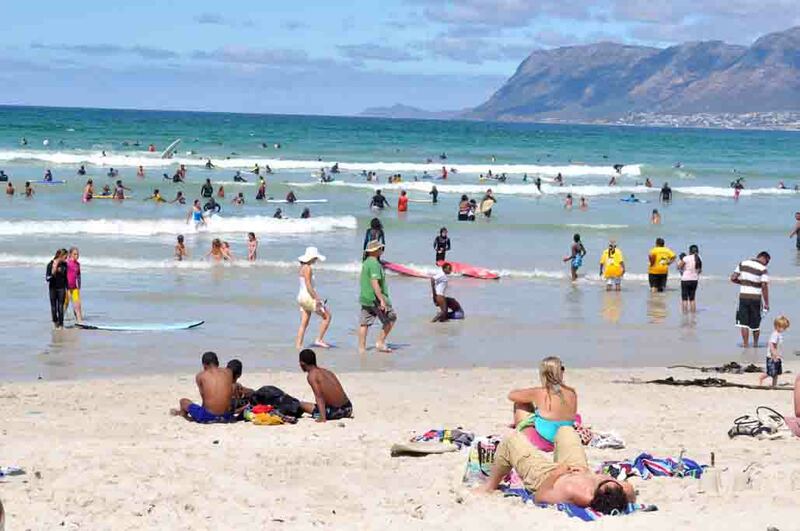 The wave at Muizenberg is generally quite small and breaks gently, making it a particularly popular beach for people wanting to learn how to surf. Paddling out at Muizenberg is like driving into oncoming traffic, you constantly have to dodge and dive to avoid collisions with other surfers. Getting a wave to yourself is a rare occasion and everyone paddles for the same wave making it a free-for-all wave frenzy. Surfing etiquette? What’s that? I wasn’t out for long and before I could even react a surfer rode over me leaving me to bleed in the sea. 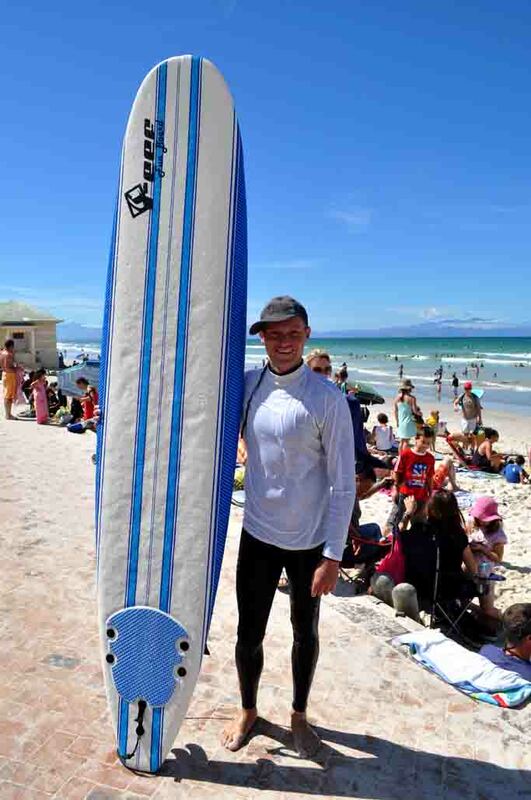 Apart from the perils of surfing at Muizenberg, it can be a fun place to surf, especially when there’s a record to break. In 2009, the Earthwave Beach Festival saw 443 surfers take to the water, attempting to set the Guinness World Record for the most surfers to ride a single wave. 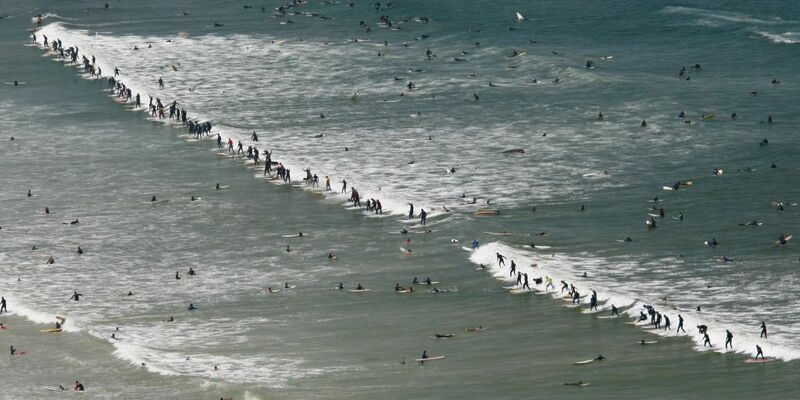 The attempt was successful, with 110 surfers riding the same wave, beating the old record of 100 set in Santos, Brazil in 2008. To this day, Muizenberg holds that record proudly. 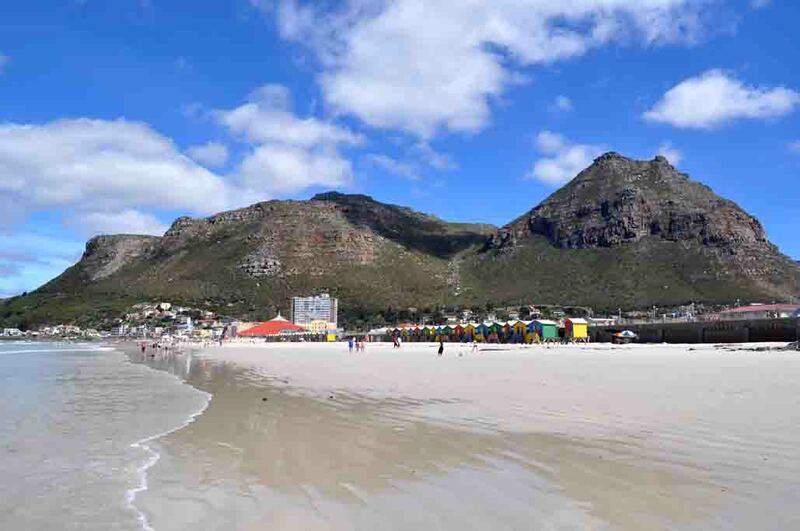 Another interesting fact is that Muizenberg is considered to be the birth place of surfing in South Africa. 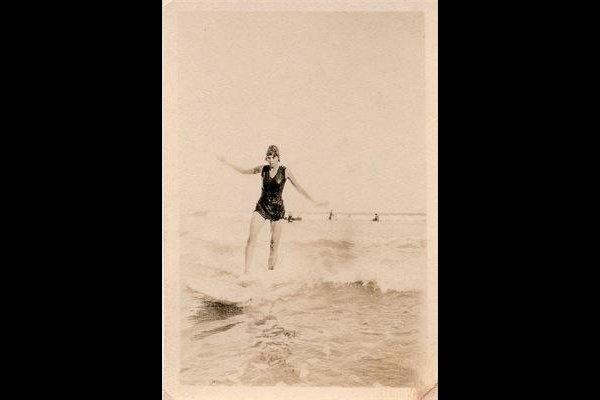 The earliest recorded surfing event in South Africa apparently took place in Muizenberg in 1919 when Heather Price, a Capetonian woman, befriended two American marines who disembarked in Cape Town on their way home after World War One. The two kind gentlemen happened to have solid wood, Hawaiian style surfboards and proceeded to introduce Heather to stand-up wave riding. The photograph of Heather Price surfing in Muizenberg speaks for itself. If you ever have the pleasure of visiting Cape Town and have the nerve to learn how to surf, visit Muizenberg, rent a board or a surf instructor and go for a paddle, you might be pleasantly surprised at how fun surfing really is. Good luck and enjoy. This entry was posted in Surf, Travel and tagged American, Beach, Brazil, Crowded Surf spots Cape Town, Earthwave Beach Festival, Guinness World Record, Hawaiian surfboards, Heather Price, learn how to surf, most crowded surf spot in South Africa, Muizenberg wave, popular beaches in Cape Town, popular beaches in South Africa, Rent a surfboard muizenberg, surf instructor muizenberg, Surfers Corner Muizenberg, Surfing Etiquette, Surfing history in South Africa, Surfing in Cape Town, Surfing in Muizenberg, Surfing in Muizenberg Cape Town South Africa, surfing in South Africa, surfing waves, waves, World War One. Bookmark the permalink. I used to swim through and over those giant waves when I was a ten year old girl with my sister. That was 40 years ago. Muizenberg was a beachgoers paradise in those days, not surfers.